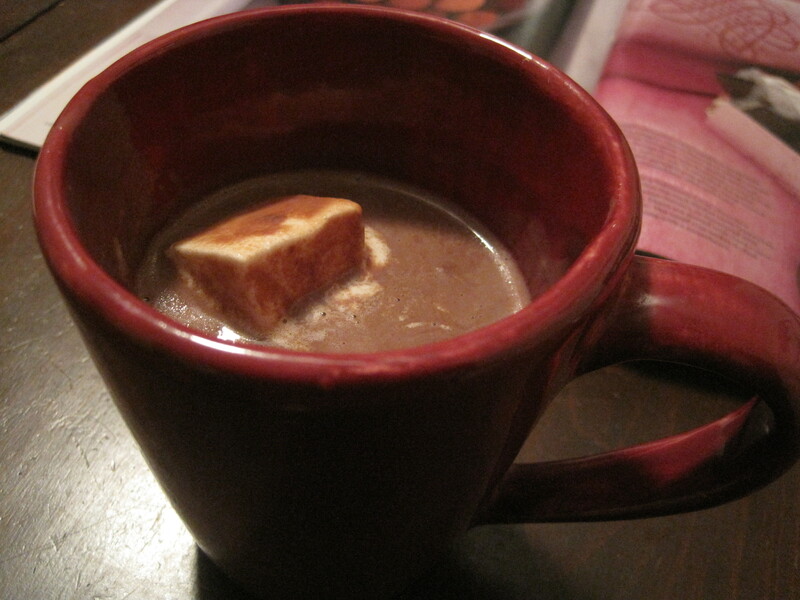 Hot chocolate is something almost everyone likes. 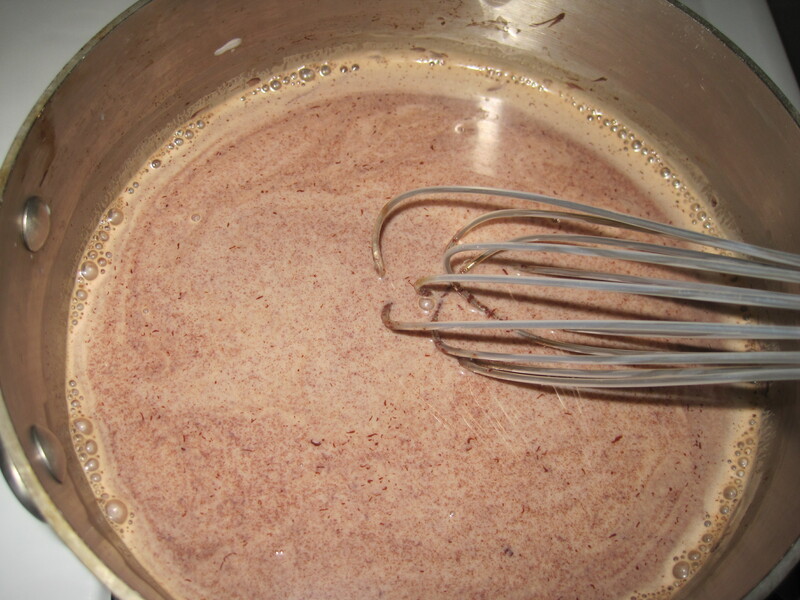 Even those who aren’t fans of chocolate cake or brownies will usually accept a hot chocolate. There’s something so comforting, so nostalgic, about it, the way it conjures up memories of being drawn into the safety of home and kitchen, where any negative stuff that happened during the day floats away in the steam of what’s brewing on the stove. Those of us lucky enough to have had a cup of hot chocolate waiting when we got in from wet January school days or from snowball fights don’t forget. This recipe makes one intensely thick, velvety mug of hot chocolate, one you could feasibly drink without a spoon, but having a spoon really helps. First, take out a good mug—something worthy of what it’s about to contain. Nothing wussy for this. Thick earthenware or ceramic does the trick best. If it has little stenciled snowflakes on it, all the better. Next, take out a small, heavy saucepan. 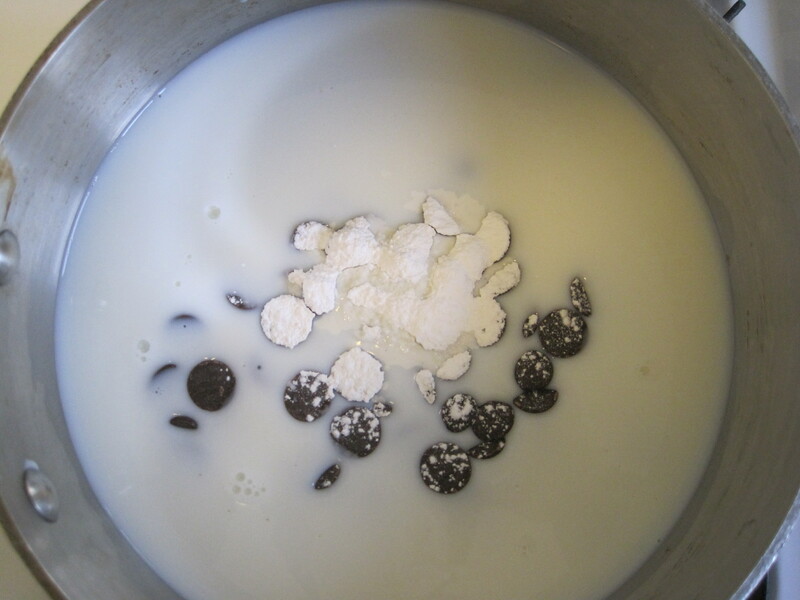 Set it on the counter and put in a cup of milk**, 1 1/2 tsp cornstarch that you’ve put through a strainer (just to get any lumps out), and a little handful of very good quality chocolate***. I know hand sizes are different. Mine is dinky, and the amount I use, about 1/4 cup, works well for me. But if you have big hands and/or a tendency to speak in tongues after consuming too much chocolate, scale back. 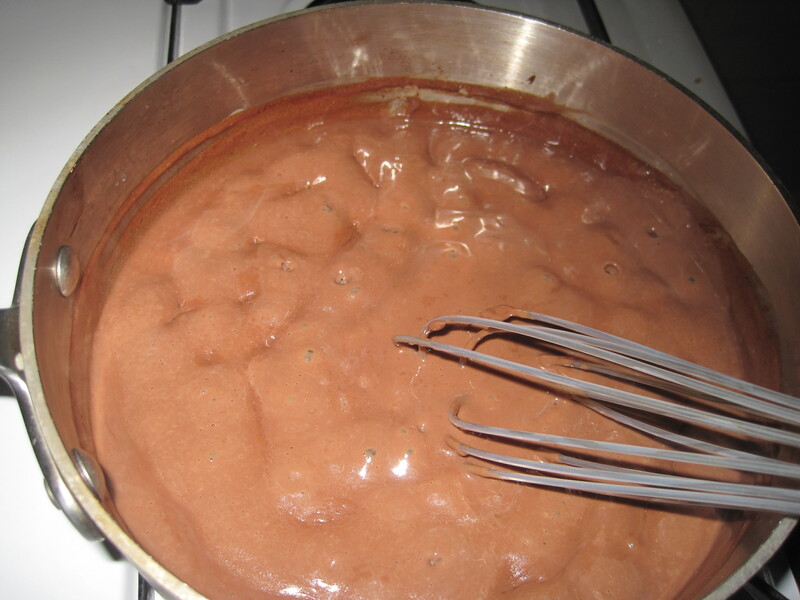 Turn on the heat to medium and stir with a whisk to help melt the chocolate and bring everything together. This takes a minute or so. Keep stirring. Take the pan off the heat and let it sit for 5 minutes to regroup. Then use a rubber spatula to pour it into your very appropriate mug. If you have a homemade marshmallow on you, by all means, grace your drink with it. A blob of highly slurpable real whipped cream is nice, too. Now take your drink and spoon and sit and look out at the snow falling. If it’s not, imagine that it’s snowing. You’re already halfway there. *That sounded judgmental, I know. But you haven’t tried this yet. **Faithful reader Dawn is an advocate of organic milk, and so am I. It really does taste creamier, not to mention you won’t be ingesting pesticides, hormones and steroids. Doesn’t matter if you use whole or low fat milk—the higher the fat, the yummier, of course—but I regularly use 1% and love it. ***I used 60% bittersweet chocolate buttons here, but I actually like semisweet better for hot chocolate. It has a really appealing tang that bittersweet doesn’t. Organic chocolate will taste cleaner, if that makes sense. Purer. You can also use good quality white chocolate. Really good, and if you save some to drink cold in the morning, it tastes a little like a milkshake. hi lady! so nice to see you here. 🙂 yes, just put an oven mitt in the fridge, sit the pan right on top of it, and walk away for the night. in the morning it will be a DREAM. enjoy!